The "CHRISTMAS HOUSE" is an incredible experience. Nestled on a dark street in a quiet little town called Washingtonville, NY, it is Christmas on steroids. And that's just the outside of the house... Every room inside is loaded to the gills with Christmas doodads and whatzits. Classic stuff too; trains, little villages, a hall of thematic trees like the Irish Tree, the Sports Tree, the Penguin Tree, and... the Creepy Singing Tree Which Has Lips and Big Eyes (my personal favorite. I'm not going to explain it to you. Just go! You'll find it downstairs and to the right. Or should I say, it will find you!) Each year, before heading home from NY, my wife, myself, and a bunch of the family make a pilgrimage to this mecca of music and lights. It's open from December 20 to the 30th, from 7pm to 9pm. The CHRISTMAS HOUSE: It's mind-boggling, it's sensory overload! The Palmer family will greet you, dressed all in North Pole attire. And donations are gratefully accepted to help offset the electric bill, which I would guess is somewhere around $139,082 a day! PS - the CHRISTMAS HOUSE happens to be a beautiful family tradition for many in the area and beyond, dedicated to the memory of Christopher Palmer, who LOVED Christmas like crazy, as you'll see. Check out more info here. Open Up and Say AWE - from the CS&T column "Catholic Currents"
One of my favorite words is... sehnsucht. I realize you probably weren't expecting that one, and you may have trouble even figuring out how to pronounce it. My apologies. Sehnsucht is a German word that captures (and at the same time can not actually capture) that mysterious longing in the human heart for Something More. In a sense, it's a uniquely human word. It describes the human condition. It names us and claims us as the special ones in the galaxy; the ones whose “hearts are restless until they rest in"... well, let's get to that answer in a moment. All of us at some point or another have experienced sehnsucht. Many of us feel it intensely at this time of year. It glimmers in the anticipation of Christmas and it can also elude us as Christmas slips away again. It is the proverbial wind in the hand, moving past us and through us but never remaining too long within us. Sehnsucht is like feeling nostalgia for something you actually never had in the first place, but you believe is still out there waiting for you “just around the river bend.” C.S. 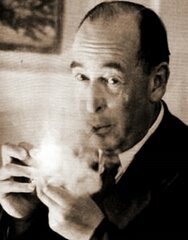 Lewis was captivated by the concept of sehnsucht. 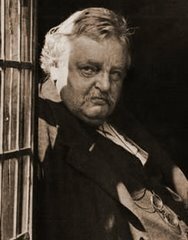 In The Pilgrim's Regress he provided examples of things that can wrap an image around it, like a suit of clothes around the Invisible Man: "...the smell of a bonfire, the sound of wild ducks flying overhead, the title of The Well at the World's End, the opening lines of "Kubla Khan", the morning cobwebs in late summer, or the noise of falling waves." Music is one of the brightest wrappings to give form to our elusive yearning for meaning in life, and Christmas music doubly so. Chanting choirs, children’s voices, songs we’ve heard for generations, and some new ones that have a spark of longing in them. Even the "Grinchyest" of hearts has a favorite tune. 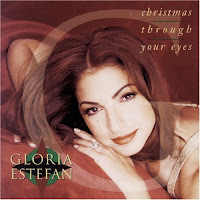 Although I’ve heard Gloria Estefan’s song “Christmas Through Your Eyes” in seasons past, this year it really struck me. I think it’s the presence of our little boy, who’s just over a year old now. We’re looking backwards to our youth and forward through his! Gloria too is captured by the innocence of young eyes and the pure wonder reflected in them. Like an expert spy, the power of her music has slipped past the guards of doubt and cynicism and touched the very core of who we are, all of us, deep down; Children of God. It’s been said that boredom is a relatively new term. The French coined the word ennui to describe that listlessness we see around us, the great shuffling of modern feet through a world that’s being stripped of its inherent transcendence. We’re like the character in the film Joe versus the Volcano, trudging off to work, scraping our shoe against the sidewalk crying out “I’m losing my sole.” But in the wisdom of God, and through the fruitfulness He endowed us with, we have the grace to “feel again through your young heart.” With everything human, however, there must be a choice. We must decide in this walk of life to look up, to resist the gravitational pull of skepticism and mistrust. We must acknowledge the restlessness too, and let the hole in the center of our hearts remain open. Not easy work by any means, especially in this season when we are bombarded with the temptation to cram material, finite things into that hole in the center of our chests. But our hearts will be restless until they rest in God, so Augustine reminds us. I remember a little shard of poetry that says “Two men looked out through prison bars. One saw mud, the other stars.” So where are we in all of this? Are we amazed or dazed? Have we got the wonder, I wonder? As the assault on family, faith, and fertility rages on in our culture, perhaps we’d all do well to heed those street signs that say “Watch Children.” We need to see again, and not just Christmas, but all things through their eyes. For to just such as these is given the Kingdom of Heaven. Do you believe this? Did you know that your heart is the place He wishes to dwell? Let’s make our hearts that manger this year. 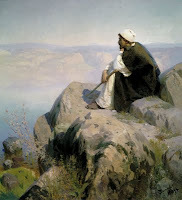 Let's acknowledge the longing in us by naming Jesus in one of His ancient titles: Desire of the Everlasting Hills. Let’s make room within for the Child in all of us. We were so proud of our little drummer boy, who sat for this homemade photo shoot (though truth be told it lasted about 36 seconds.) It's amazing what a hand towel, bathrobe, old belt and bed sheet can do in a fix! Wishing you all a truly blessed and faith-filled season of Light. Thanks for following the Blog! What a bizarre time this is; the Christmas season. Never is there a period of such polar opposites as there are at this time of year. All around us we are bombarded with the imperative to consume, collect, grab, and grasp. 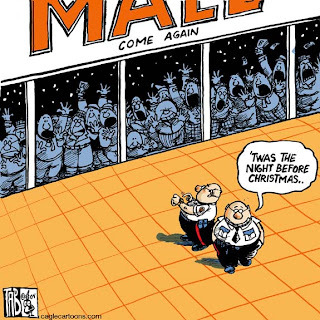 There are lines of impatient, honking, beeping, cranky souls snaking through the shops and malls all around us. Incredible pressure is laid on people to find this or that gift for this or that niece or nephew, cousin or coworker. It can bring out the absolute worst in people (and let me add, the best). THE WORST: I watched a woman in her 50s sitting in her car with her elderly mother curse out a car behind her for honking at her... one honk. And it was one of those friendly little honks too. Grandma just kinda slid deeper into her seat, clutching her purse. When Sunday comes, we roll off to Church and hear just the opposite. "It is better to give than to receive" - "God so loved the world that He gave His only begotten Son..." - "wrapped him in swaddling clothes and laid him in a manger." The radio plays as we whiz through the thousands of cars in the parking lot, like vultures looking for an open space... "Away in a manger, no crib for his bed, the little Lord Jesus laid down his sweet head." We drive home flustered, past little glowing, plastic nativity scenes of a man and a woman kneeling in the snow, gazing down at a little plastic Child. A whole plastic, glowing mob of souls gathers round the Babe; kings and shepherds, the rich and the poor (and occasionally a big plastic Snowman or the Grinch, which is a whole other story). What do we make of all this? I was out shopping last year, trying to stay focused, trying to recall what we are moving towards in these next couple of days. Standing in a massive line at Borders, with Mr. Cranky Pants on his cell phone behind me, a youth in angst blurted "Merry (expletive) Christmas" to my left, as only a youth in angst can do. I prayed for a great awakening. I prayed the whole glitzy, glamourous scene would vanish, roll back like a stage curtain, and we would all find ourselves kneeling in that cold cave in that backwater town of Bethlehem. Unplugged, unknown, and alone... looking down at a very poor couple who had to find a place to rest their newborn baby... and the only "space" they could find was a feeding trough for animals in a stable. Scandalous. That would make the news, wouldn't it? Wouldn't that stop us in our tracks? Hmmm, I don't think so. You learn when you go out into the wild, for a campfire, or a night of stargazing, that bright light can take away your night vision. Perhaps we'd do better to unplug ourselves for a little awhile in this season of lights, and maybe we'd get our vision back. We're told to be good consumers, to boost this failing economy. But this consumption of things will no more help our country than it will satisfy our souls. Someone else has come with a better plan for our salvation. 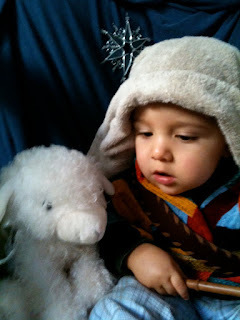 He lays in a manger (the word means "to eat") and he is born in Bethlehem, which means literally "house of bread." And he looks at us all, racing about stuffing our stockings and stuffing our trunks with things. And he says, "Take and eat, take and drink; this is my Body, given up for you." We are invited to consume, to eat and by eating become one with the Love that has become our Food. This is the Love that truly satisfies! This is the Feast of Christmas! For an amazing website all about Our Lady of Guadalupe, click here. The Boy Wonder Chronicles - First Steps!! 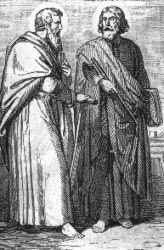 Yes, the strains of James Taylor’s famous tune “Walkin’ Man” came to me as I was reading about our “saint du jour” today, and you’ll soon see why. Juan Diego was born in 1474 in what today is a part of Mexico City, Mexico. He lived a simple life as a weaver, farmer, and worker. He was baptized at the age of 50 by a Franciscan missionary, and so began a faithful “walk” with God each day…15 miles to be exact! Every day, and mind you he was in his fifties at this point, Juan would walk to Mass. 15 miles! He is more famous for the amazing miracles he witnessed at the hands of Heaven; Our Lady appearing to him, the roses the bishop asked for blooming in winter, and the magic of the tilma, a stunning work of art painted by Heaven itself on his burlap clothing (which still exists today, defying all scientific comprehension and study). We’ll hear more on that one this weekend - The Feast of Our Lady of Guadalupe. But in all this, it was still his walk that struck me. 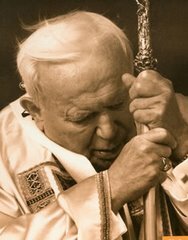 The dedication, the patience, the sheer strength of his character, his obvious passion for the Eucharist….. staggering. And when Mary Immaculate called him to his special mission, he called himself a “nobody.” Wow. The next time we attend Mass and are “distracted” or “bored” or feel we’re not “getting anything out of it….” Or we feel it’s too early, or the preaching stinks, or the music stinks…. 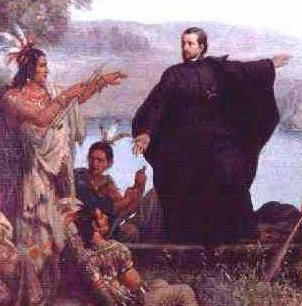 think of Juan Diego, barefoot, walking 15 miles through desert terrain to stand, to kneel, and to bask in the glow of that Divine Fire of the Eucharist…. The same Fire of Heaven we are invited to taste every morning, in our parish church, chapel, or city church. 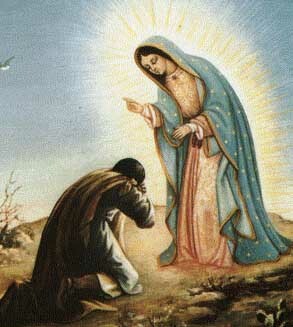 St. Juan Diego, humble servant of Heaven, pray for us... give us some of your faith and your fire of love! We've shared this invitation/request with a few friends and family already, but we are "sending" it out officially now. Last year, we lost our precious baby daughter Grace Elizabeth. She was born on January 4 and died the same day, just 10 hours later. 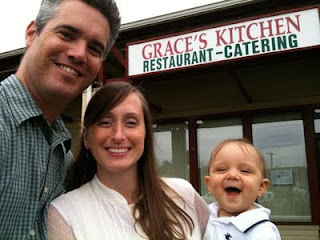 The full story of our day with Grace is linked here - http://missionmoment.blogspot.com/2009/01/our-amazing-grace.html. Needless to say, those 10 hours, and the 9 months she lived with us in the womb will never be forgotten. To celebrate her short life on earth, and especially her peace and joy now in Heaven, we want to invite you to "seek grace" with us in the signs all around us... literally. We are compiling a photo album of Gracie's pics, and we'd love to receive one everyday, until we're old and grey. It will force us to slow down and think of her especially in that moment. Please keep a look out, Grace is everywhere! Have you ever been captivated by a word, a phrase, a song? Has it drawn you in? Do you return to those words, that music, again and again? I have books that are weathered, crammed with bookmarks and holy cards, pages dripping with the ink of my notes, and the faded glow of a highlighter. I have songs that if they were still in cassette form, would sound like they were singing underwater! 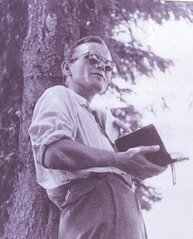 Like a thirsty man, I return to the sweet ambrosia of Jesus, John Paul II, John Mellancamp, Thoreau, Kreeft, Sheen, Morrison, Einstein and others again and again. There are thoughts and ideas, insights and inspirations that do not age. There is Truth and Beauty in our midst, wrapped in immortality as in a robe, shielded from our mortal weakness. They are here to warm us in a post-modern age that has too often stripped life of its transcendent truth and meaning. 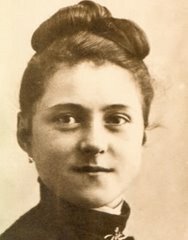 Today’s saint was one who was so clothed. 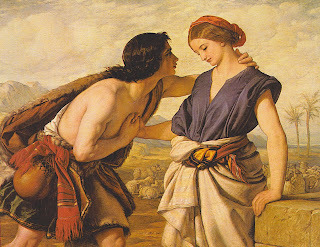 Ambrose was ambrosia to those around him. He hailed from the 4th century, a bishop and teacher, and his words burned with that eternal fire, and we are forever grateful. Because of his preaching, the great Augustine was converted; he who was a drifter was caught in Ambroses’ stream of inspired words, and the music of the Mass. So what are the thoughts and ideas, insights and inspirations that you have been captivated by? What Truth and Beauty do you return to, especially in these days of holiday hastiness, and the rush of the culture to fill every void of silence, and empty every pocket of substance? Where is the ambrosia that fills you up? It's with a sad and heavy heart that we see the passing of the Irish troubadour Liam Clancy, last of the Clancy Brothers, who died this past Friday at the age of 74. 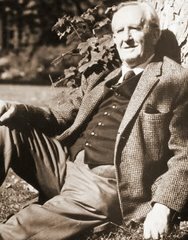 Liam, with his brothers and Tommy Makem, lifted Ireland's heart high in the folk music revival of the last century, and brought much of Ireland's soul to America. This music fed me for many's the year, and many's the meandering through green fields and woods. 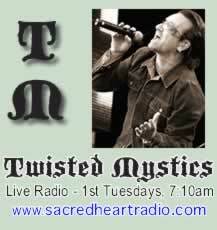 Their music hits the heart, and leads the mind into open spaces and forgotten things. The things that shaped a people, and continue to shape them. In our day of glitzy pop music, pyrotechnics, and shock and awe lyrics, the Clancy Brothers are a refreshing blast of salty air from the Irish Sea. Enjoy this classic tune "Red is the Rose" and a real gem; the Brothers being interviewed on a Scottish program, speaking on their art of folk music and the need for the genre now more than ever. 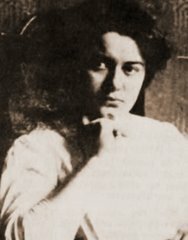 The spirituality of Carmel has its roots deep in the Old Testament. In figures like Moses and Elijah, Hosea and Isaiah, we see souls climbing up the holy mountain, not content with living a kind of suburban, comfortable distance from the City of God. These mystics plunge into the Mystery of the Heavenly Jerusalem, and they toss out ropes and life-lines for us to scale the holy mountain too. 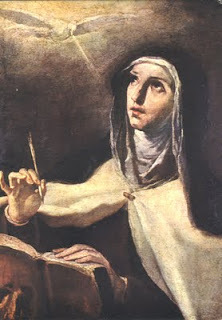 John of the Cross, Teresa of Avila, Therese of Lisieux, Edith Stein... all invite us beyond mere legalism into the Love that fires the heavens. 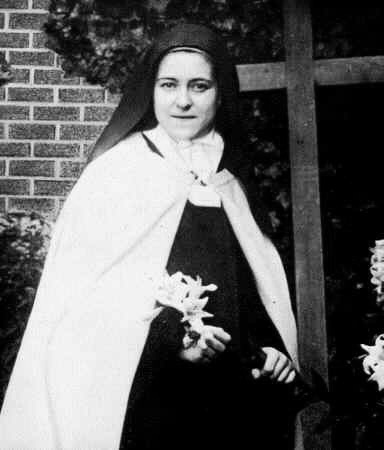 Carmelite spirituality influenced the work of Pope John Paul II. 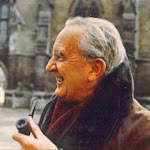 It's fragrance broke into his heart and he has allowed that odor of sanctity to permeate his letters, addresses, and most especially, deep into his teaching on the Theology of the Body. 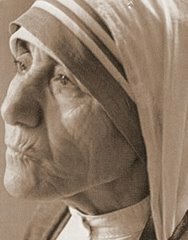 Yes, dear brothers and sisters, our Christian communities must become genuine "schools" of prayer, where the meeting with Christ is expressed not just in imploring help but also in thanksgiving, praise, adoration, contemplation, listening and ardent devotion, until the heart truly "falls in love." A famous and very learned Catholic theologian was once asked about the most profound thought he had ever had. He said it was simply "Jesus loves me." I think I'm just starting to see the real Jesus and to feel His love for me. According to Pope Benedict XVI (God is Love, 10), this Sacred Heart, this Bridegroom, in fact has an eros for us, for me! Sometimes the thought comes like a blast of wind through the old dusty alleyways of my own interior castle; Jesus loves me. I get the sense that He is knocking on more doors than just one. That from the moment that I first let Him in, He's been exploring other rooms; deeper levels of me than I ever knew I had. Jesus comes to love us in every one of them, and always as a gentlemen; He knocks first. I think this love then, elicits our response. 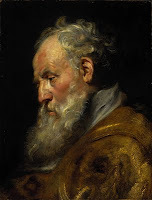 God is More than a Lawgiver, or a Judge, or a Friend.... "Our God is a consuming fire..." (Hebrews 12) He wants to be the Burning Bush at the center of our interior castle. Will you let Him in? Will you give Him your heart? 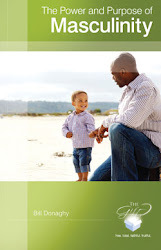 Visit the online journal here. There are precious few things that slide through the culture untouched by commercialism and glitz and glam. Thanksgiving is one of them. Today is about family, food, being together, and after everything's been prepared, doing nothing. So let us all be thankful for the gifts that surround us, big and small. God is good... and pass the gravy! How many times have we seen a movie or a TV show with the iconic "crazy" person on a street corner wearing a placard with "The End is Near" scribbled on it? And how many times have we quickly dismissed that person as extreme, ludicrous, ultimately sad? But have you ever gotten the itch that invites you to scratch and see below the surface? What if it was true? It seems Hollywood has the itch.... really bad. She can't make the budgets big enough for these gloom and doom dramas about the End of All Things, from Armageddon and Deep Impact to The Day After Tomorrow and last weekend's latest installment "2012." The box office seems to be saying something as well; people love it. People want to see it. It may be out of a morbid desire to see historic landmarks crumple under a 900 foot tsunami, but behind that, I think there's a bit of good 'ole fashioned Catholic spirituality at work. Memento mori, as the saying goes. "Remember death." As creepy as it sounds, we're invited to reflect on our death many times throughout the liturgical year. We're actually entering into the season for this right now. Advent is beginning, and it is more than just a glance backwards to the Birth of Jesus two thousand years ago. It's a glance to the future, to the End, when we believe He will return. This story, History, will indeed end... and simultaneously.... begin. Jesus said to his disciples: "In those days after that tribulation the sun will be darkened, and the moon will not give its light, and the stars will be falling from the sky, and the powers in the heavens will be shaken. And then they will see 'the Son of Man coming in the clouds' with great power and glory, and then he will send out the angels and gather his elect from the four winds, from the end of the earth to the end of the sky. The twist however is that Christians look to this End with, now get this, joyful expectancy. "Lift up your heads, Scripture tells us, for your redemption is near at hand!" Now this doesn't mean we sit around with hands up high like kids waiting for Daddy to pick them up and take them to his warm chest and carry them home. (Although that sounds like the orans position of prayer and a great way to live to me!) It means we keep our feet on the ground and keep working. And we whistle while we work, too, like little dwarves, keeping the Palace of our hearts clean for the arrival of our King and Queen. St. Francis was once approached by a nervous brother friar, who was a bit stressed about the End and perhaps more so, about his conscience. Francis looked up from the patch of earth he was tending in the garden. "Brother Francis, what if our dear Savior were to return this very day. What would you do!" "I would keep gardening, until He found me" smiled the saint. Now that's peace. For the believer, the End is not at some remote or proximate point, not a number like 2012, or 3012 for that matter. The End is... here, now. The Kingdom of God is within you, here, now. It is already, and not yet. All of the world that we see is simply a veil pulled over the Eternal Now where God abides. Why should we be afraid? Can the unborn child in its dark and watery womb imagine the vibrant life that moves about just past that veil of mommy's flesh? Can it be so near and yet seem so distant? Perhaps our End is closer than we think. Maybe our true birthday is about to begin, as it has for the saints. Their death is remembered as their feast day, their birthday into Eternal Life. In the meantime, as we close off another liturgical year, and step closer to 2010, 2011, and 2012 (wink wink), let's not panic, let's pray.... and keep smiling, with our heads and hands busy in the garden of this world, preparing a harvest of good deeds and much love for the World to come. 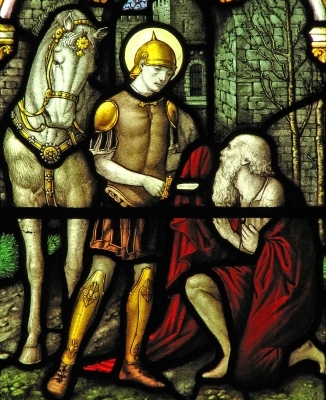 Today’s saint, Martin of Tours, saw the Man behind the curtain, and it changed his life forever. He lived and breathed, sweat and struggled on this earth in the 4th century. 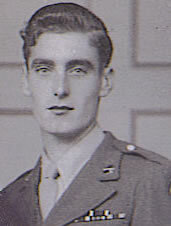 He was born in Hungary but was raised in Italy, forced into military service at the age of 15. He became a Christian and was baptized at 18. Martin was known to be more of a monk than a soldier. 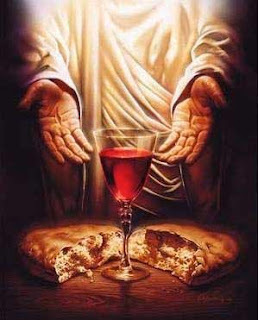 At the age of 23, he made his great leap of faith, refusing a war bonus and making this request of his captain: "I have served you as a soldier; now let me serve Christ.” Newly welcomed into the faith, he saw a beggar on the outskirts of the city. Still in his military garb, moved to compassion, he took out his sword and cut his cloak in two pieces, covering the poor man and, to the scorn of onlookers, awkwardly covering himself in the cold with the other half. That night he had a dream. A man appeared to Martin, clothed with the garment he had torn in two. It was Christ himself. After all of these centuries, the disguise of Jesus remains the same – and the saints can see through it. Like a veil covering the Holy of Holies, Jesus walks among us in the broken, the neglected, the forgotten, the uneducated, the awkward. What will we do before this beautiful face? Turn away, walk to the other side of the street, change the conversation? Or shall we let our prejudices, rash judgments, and fears be torn in half, like the Temple Veil, and reveal Jesus to the world? There’s a patron saint for everything and everyone, you know… African-Americans, Barbers, Hairdressers, Race relations, Social justice. In fact, for all of these, it’s the same saint – Martin of Porres. Martin was the son of a Panamanian woman, probably black but possibly Native American, and a Spanish man of Lima, Peru. Having inherited his mother’s dark complexion, Martin was not acknowledged by his father until his eighth year. Talk about a “father wound!” After his sister was born, the father abandoned them, and the family grew up locked in deep poverty. 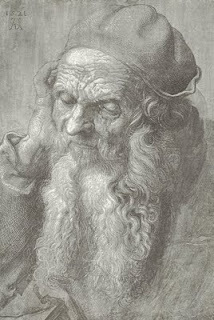 But rather than become bitter about his circumstances, Martin became better. He gave his heart to his fellow poor, served as a Dominican helper and later a brother, pouring himself out tirelessly for people’s welfare, both temporal and eternal. What a shame that Martin’s father, consumed with his own image, missed the image of God stamped in the beautiful body and soul of his son Martin. Where is that father now? What choices he must regret and what opportunities are now lost! Or perhaps the prayers of the son turned the heart of the father? May we imitate Martin’s humility, for the humble shall be exalted. And may we not miss in the ordinary, small, and obscure things in life, the mark and the mystery of the Divine. Simply saying this three letter word can conjure up different thoughts for different people these days. Thoughts that perhaps are hard to wrap our heads around, let alone our arms: A Bright Light, billowing clouds, a booming disembodied voice, a Force that is distant and yet somehow accessible, or even a kind of Cosmic Grandpa who some say actually hears us through a thing called prayer. For others today, the word GOD seems small, antiquated, and irrelevant. Hasn't science disproved all that supernatural stuff? "We've evolved as a species and feel it no longer necessary to have a psychological crutch like GOD to get us through this life." Finally, for others, (and this one perplexes the unbeliever to no end) GOD is as close and intimate and personal as, well, a person. God, they say, is above all a Lover, in fact, and He is crazy about us measly humans! So crazy that He came among us and has now and forevermore, a human face, a human heart! These folks believe Divinity married humanity in Jesus, forever. I think in our American culture, so focused on ME that we too often forget about the OTHER, the idea of an objectively real and personal God somehow feels like an affront to our freedom, our reason, and individuality. God? Oh, right. Him again? The Big Landlord? Believing in Him means joining the rank and file and stifling the fun. It means losing your spontaneity and intellectual freedom because every Sunday you have to blindly "pay the rent." Or pay for "fire insurance," as some glibly joke. But this is ridiculously simplistic. In our deepest being we all know that we were not made for laws. We were made for love. I think this fear of losing ourselves in a love relationship with God is actually keeping us from true freedom. After all, when we close the door to the transcendent, we fail to become fully human. A caged, clipped bird can forget it was designed to fly. Humans by nature are religious beings, made for the Infinite, made for the Bottomless Mystery of a God Who loves us. We have a longing for this unending love, truth, and a beauty that does not fade. Need proof? Just listen to your own heart's desires! (or the music of Journey or Foreigner, heh heh). We long to give ourselves to the Infinite, to lose ourselves in Love, but when we close our minds to the idea of it being really real, transcendent, responsive, immanent through grace, then we clip our own wings. Consequently, we discover that we cannot give ourselves fully to anyone. When we deny or dismiss the Infinite as unreal or irrelevant, we end up eventually stagnating in a pool of boredom. or narcissism, or egocentrism. What is the meaning of life if the source of that Life is dead? We then fall back on ourselves, but without the real power to love, to get beyond ourselves, to transcend. Then we settle on giving part of our hearts but not all, or worse, we go through relationships grasping instead of trusting that love will be given to us. So where is the truth that will set us free? How can we know if God is real, and really loves me? Read Scripture. When we're quiet and alone with that book, we can get some pretty deep thoughts. You might even catch a thought like the one Augustine whispered to himself way back in the 4th century when he cracked open the Scriptures. "The deepest desire of my heart is to see another and to be seen by the Other." Is God Love? Is it just Law? Well, ask God. Let Him in, and you'll discover you have an infinite capacity for Him. And if God is truly a Person, a Communion of Persons, in fact, then how else could we actually know Him unless we let Him into the heart? I don't think my way through relationships with people, I don't reason out the issues at stake, mentally prep myself to fall in love. "On September 24, 2009 at precisely 9:37am I will fall in love." No, I reach out and speak words. I open the mind and let down the guard a bit with the one standing before me. I listen, wait, gaze long and let myself be looked upon. That look builds a relationship. Why should this be any different with God? 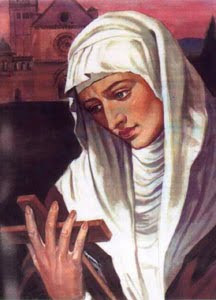 Prayer can progress, as a genuine dialogue of love, to the point of rendering the person wholly possessed by the divine Beloved, vibrating at the Spirit's touch, resting filially within the Father's heart. This is the lived experience of Christ's promise: "He who loves me will be loved by my Father, and I will love him and manifest myself to him." Do you wanna be happy, whole, integrated, joyful, successful, at peace, part of something amazing, purposeful, powerful, confident, loved, loving, redeemed, relaxed, realized, real? Then you wanna become a saint. Do you wanna be a person in touch, in truth, inspired, desired, magnetic, magnanimous, moved, and moving? Then you wanna become a saint. So save yourself all the yogi guru self-help hullabaloo. Wholeness is simpler than that - it's found in holiness! Let's cut through all the plaster cast, plastic past, Campbell's Soup Kid lookin' holy card pictures of saints for a moment. 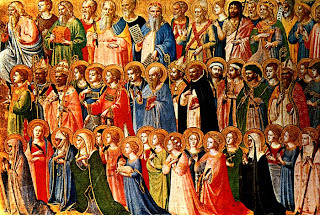 What does it really mean to become a saint?